VIE Hotel Bangkok, MGallery Hotel Collection, is a luxury design Bangkok Hotel near BTS. 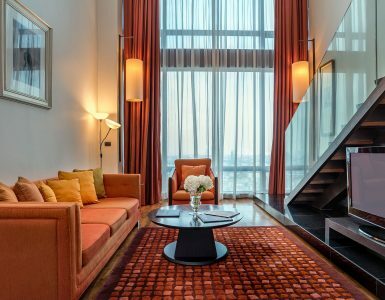 Located in the heart of Bangkok’s world-renowned shopping district, VIE Hotel Bangkok is just a short walk to the city’s most famous shopping malls including Siam Paragon, Siam Discovery, Siam Center, MBK, Pratunam, and Central World. As a Bangkok Hotel near BTS Ratchathewi, right next to Siam, all of the exciting sights of the city are conveniently accessed from VIE Hotel Bangkok via the BTS Skytrain system. With the Ratchathewi BTS station situated less than a minute’s walk from the hotel, guests can enjoy a stress-free commute to and from VIE Hotel Bangkok and almost anywhere within Bangkok. Even better, the BTS Ratchathewi station is just one stop away from the Airport Link, which offers guests a smooth train ride and a traffic free commute to Suvarnabhumi International Airport. The benefits of being a Bangkok Hotel near BTS cannot be exaggerated, due to the daily possibility of heavy traffic during Bangkok’s rush hour. It saves time and worry, as well as brings passengers to their destinations in minutes. The convenience of the BTS Skytrain is its connectivity, but also its customer service. Helpful staff can answer questions and direct you where needed. This includes signage and announcements in both Thai and English throughout, access for the disabled, and a variety of ticket options that include a full day pass or single ticket options. The clean and efficient facilities of the stations and trains make it a pleasure to ride — as does the fascinating views of Bangkok seen from high above on the track as the Skytrain flies overhead. We look forward to welcoming you to VIE Hotel Bangkok shortly!